Pope Francis departed Wednesday for Panama where he will participate in the events of the 34th World Youth Day. This marks the Pope's first journey in 2019. The Pope departed on an Alitalia flight from Rome's Fiumicino Airport at 9.51am (local) and will land in Panama at around 10:30 p.m. Italian time. 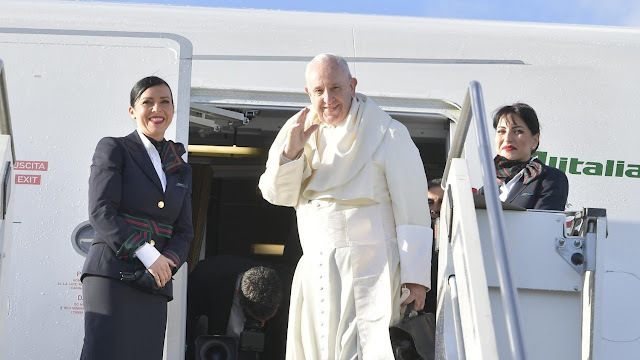 Upon arrival at Panama's Tocumen International Airport, the Pope will go directly to the Apostolic Nunciature, where he will stay for the duration of the visit. In a tweet before his departure the Pope said, "I am leaving for the World Youth Day in Panama. I ask you to pray for this very beautiful and important event on the path of the Church." Pope Francis as usual also visited the Church of Santa Maria Maggiore before his visit and prayed to Our Lady.